Congratulations on completing your CRM implementation! For all the work you've done to date, I have some perhaps sobering news: The work is just beginning. Such a statement may seem a bit daunting given all the work that you and your organization have done to date. You had to sift through the myriad of options and balance the interests of different stakeholders to select a new system. You implemented the new system migrating the constituent data, trained your staff on how to use the new system, and sent your first communications from the system. If you have worked with a progressive activist organization over the last ten years, you have likely touched Salsa in some way. Salsa is a story like so many other tech firms before in which underinvestment diminishes the product over a period of time. I do not have the full story about the company dynamics, so I will not speculate as to the reasons why the product has been allowed to languish, but languish it has. This is the first of a series on evaluating the various nonprofit Constituent Relationship Management (CRM) systems. Salesforce is a major player in both the corporate and nonprofit CRM space. For over a decade, the Salesforce foundation donated their product to nonprofits and many organizations took them up on their offer to some degree. There are poorly implemented nonprofit Salesforce instances and absolutely game changing Saleforce implementations and everything in between. My evaluation is based on having implemented salesforce over a dozen times over the last decade. Constituent engagement is the lifeblood of most nonprofit and civic organizations. Constituent Relationship Management (CRM) consists of the people, systems and processes that allow organizations to build growing networks of deeper relationships. 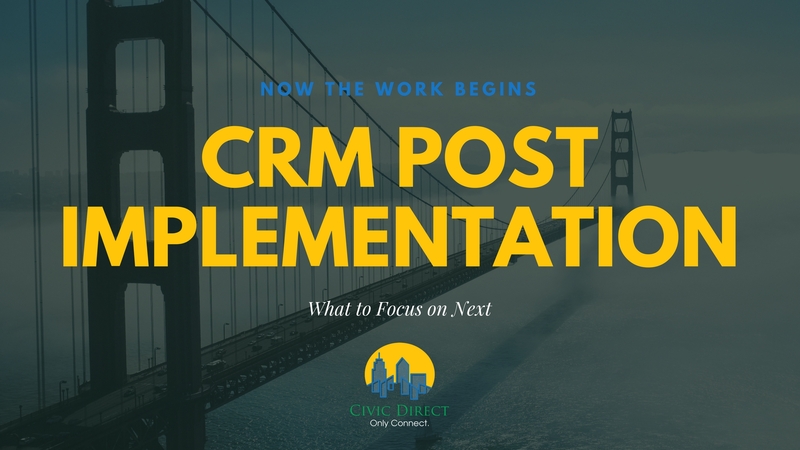 Selecting the right CRM system (the database, communications tools, and analytical reporting capabilities) is a vital activity that many nonprofits go through every 4-5 years as the CRM market changes with new capabilities to engage constituents and track interactions. Over the last couple of months, I have seen more and more job postings from innovative nonprofits that are hiring for online community manager positions. This is a welcome sign that we are fast reaching an inflection point in the adoption of 2.0 technologies. Whether creating new positions or adjusting current positions, nonprofits are adjusting their human resources to meet the growing demands of building online community. 2016-17 © Civic Direct Corp. ALL Rights Reserved.